Sometimes when a brand is widely known, drawing consumers’ attention can be even more challenging. 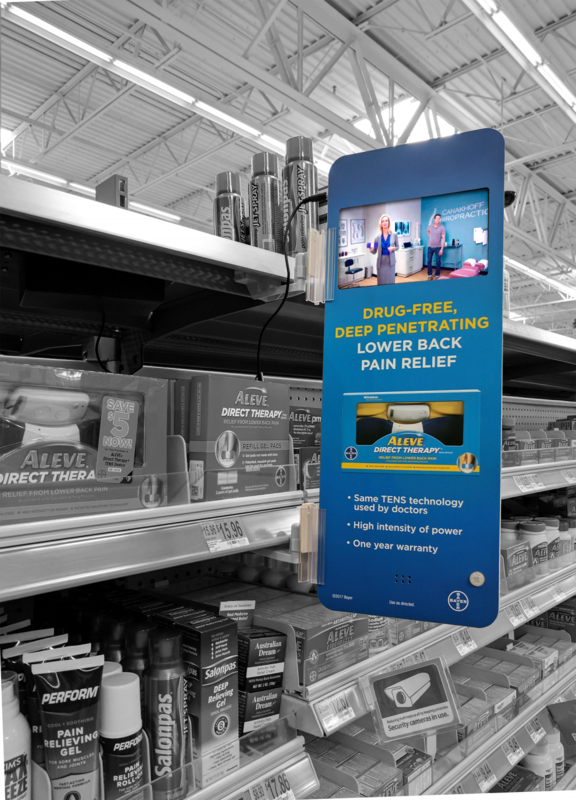 Bayer was looking for a way to generate interest in its Aleve Direct Therapy product, so it turned to Americhip to help design an instore solution for Walmart stores nationwide. Create a shelf-edge merchandising display so impressive, it’s like a billboard right in the store aisle. This patented 20-inch tall vertical Video Blade houses our proprietary 7” Video Screen and is equipped with motion sensor technology. So, when Walmart shoppers pass they immediately trigger the unit and are treated to a vivid video presentation on a luminous VIP™ screen. Our innovative Video Blades grab attention, engage your consumers and drive sales. Let Americhip create a custom viewing experience right in the store aisle for your consumers. They deserve it.